Fortescue Metals Group’s first shipment of the higher-grade West Pilbara Fines iron ore has left Western Australia for China. Fortescue Metals Group, in celebrating its achievements in the past 2018 financial year, has reinforced its focus on building sustainable mines of the future. Roy Hill has signed two memoranda of understanding with Chinese companies during the China International Import Expo (CIIE) in Shanghai. Thiess will install autonomous haulage technology at Fortescue Metals Group’s Christmas Creek iron ore operation in the Pilbara, Western Australia. Fortescue has secured eight memoranda of understanding (MOUs) with major Chinese steel mills during the inaugural China International Import Expo (CIIE). Fortescue has posted a rise in production of 14 per cent year on year in what chief executive officer Elizabeth Gaines called “a strong start” to the company’s 2019 first quarter. Technology company Aurora Labs has signed a non-binding preliminary agreement with Fortescue Metals Group to work on 3D printing technology for mining. For the past 15 years the success of Fortescue Metals Group and growth of the Pilbara iron ore industry has been guided by one man – Andrew Forrest, winner of the Prospect Awards Lifetime Achievement Award. Kirkland Lake Gold’s Fosterville gold mine in Victoria has won the 2018 Australian Mining Prospect Awards Mine of the Year. Civmec’s focus on strengthening its maintenance service offering has paid off with the award of contracts from a number of leading Australian mining companies. Hancock Prospecting has increased its offer price to Atlas Iron, from 4.2 cents to 4.45 cents per Atlas share, in an attempt to secure at least 87 per cent voting power in the junior miner. Pilbara-focused junior BCI Minerals has launched a divestment process for its portfolio of iron ore assets projects in the Western Australian region. Fortescue Metals Group’s financial performance has slumped as China has focused on using high-grade iron ore at its steel mills. Fortescue Metals Group expects the relocatable conveyor system it has operating in the Pilbara will replace a dozen trucks once it is fully operational. Fortescue Metals Group has set a new record for iron ore shipments of 46.5 million tonnes (Mt) in the June quarter, a 20 per cent increase that brought it to its full-year shipment target of 170Mt. The Takeovers Panel will not take action following an application from a Fortescue Metals Group subsidiary to conduct proceedings into the takeover of Atlas Iron. 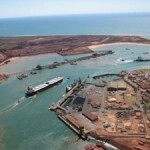 Atlas Iron has reinforced its position as a potential developer of export facilities at Port Hedland, saying it has no exclusive rights at the major Western Australian iron ore port in this regard.